A cursed nursery rhyme unleashes a supernatural being that kills anyone who sings his song. Grace Hutchinson leaves babysitter Mia Johanssen to supervise her 12-year-old daughter Jill’s slumber party with friends Alice, Charlotte, Violet, and Olivia Shaw. The girls dare Olivia to go online and sing “The Crooked Man” nursery rhyme, which is rumored to kill anyone who repeats it. Olivia does and the power goes out. Pizza deliveryman Steven comes to the house and checks the fuse. The Crooked Man appears in the shadows. Everyone is shocked to find Jill dead at the bottom of a staircase. Olivia is caught holding a bloody knife, claiming that the Crooked Man killed Jill. 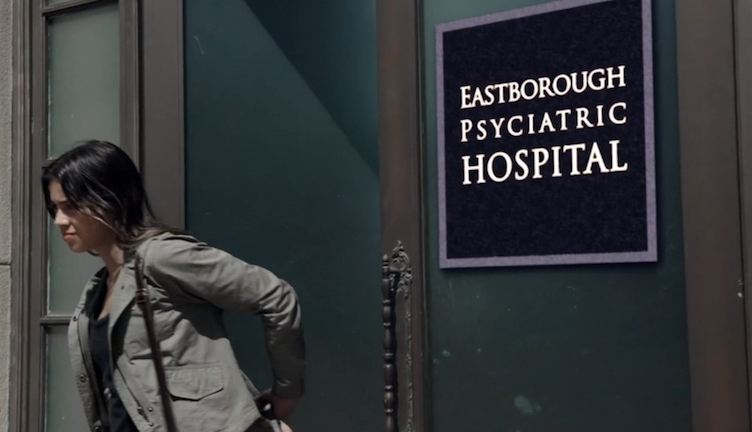 Six Years Later – Olivia is released from Eastborough Psychiatric Hospital, where she had been committed for Jill’s murder. Everyone in town, including her former friends, shuns Olivia except for police officer Noah Harris, who takes a liking to her. Noah reminds Olivia that he was the older brother of her childhood friend Becky. The Crooked Man manifests in the darkness of a lawyer’s office and kills young attorney Steven, who delivered the pizza to Jill’s house on the night the Crooked Man was summoned. Olivia revisits the scene of Jill’s murder. Jill’s mother Grace threatens Olivia to leave at gunpoint. Olivia experiences a vision of the street crumbling into crooked slabs once outside. Later, the Crooked Man kills Grace at the hospital where she works as a night shift nurse. Comparing photos of Steven’s death that she got from Noah with what happened to Jill, Olivia concludes that the Crooked Man has returned to kill those who were there the night he was summoned. Olivia takes her theory to Charlotte. Charlotte is initially dismissive until they find a sixpence coin on the sidewalk outside the diner where Charlotte works. Charlotte takes Olivia to warn Violet, but Violet refuses to listen. Olivia still tells Violet to avoid shadows. Violet finds a crooked sixpence in her pocket. Charlotte and Olivia try to see Alice, who lives as a shut-in that no one has seen in years. However, Alice’s protective mother Margaret refuses to allow Olivia inside. The girls next track down their former babysitter Mia, who is now performing as a musician at a local club. Mia sees the Crooked Man skulking in the shadows behind the crowd and leaves the stage. The Crooked Man appears in the dressing room and tears Mia apart. Olivia and Charlotte try warning a security guard, but he checks on Mia too late to save her. Olivia and Noah trace the original Crooked Man website where the girls found the rhyme to an abandoned location. Olivia and Charlotte decide to track down the meme’s source for more information on the Crooked Man legend. Violet refuses to accompany them. Olivia sneaks into Alice’s house and, after discovering the girl has been haunted by visions of the Crooked Man since Jill’s death, convinces her to come along. Olivia meets the website’s source, a man named Milo, who had been secretly monitoring Olivia since her release. Milo reveals that he was the teaching assistant to a professor researching urban legends who investigated the Crooked Man rhyme. Speculation says that the curse began as an ancient tribal incantation. The words were passed down and translated over centuries, eventually becoming the nursery rhyme circulated on the internet. When Milo realized the curse was real, he took down his Crooked Man website, but it was already too late. Milo speculates that Olivia somehow paused the curse when she went away. Now that everyone has reunited, the Crooked Man has resumed killing everyone who was there when Jill was murdered. Violet hides at a motel. The Crooked Man manifests in her room and tears off Violet’s head. While Olivia does more research at the library, Noah brings her a sixpence coin. Noah reveals that he was outside on the night they summoned the Crooked Man. His sister was supposed to be at the slumber party and he showed up to scare them. Noah sees the Crooked Man in the shadows behind Olivia. They realize that light prevents the Crooked Man from getting to them. Olivia tells Noah about a music box that Milo’s professor used to inadvertently summon the Crooked Man that might be able to reverse the curse. Charlotte sends a suicide text to Olivia as she prepares to turn off the lights and let the Crooked Man kill her. Olivia and Noah race over, arriving in time to see the Crooked Man kill Charlotte. The Crooked Man taunts Olivia before the light comes on and he disappears. Sheriff Harris, Noah’s father, insists that Noah take Olivia into custody for Charlotte’s death. Against orders, Noah instead takes Olivia to see the daughter of Milo’s professor. They convince the woman to give them the music box, but they become wanted fugitives in the process. The lights go out at Alice’s house. The Crooked Man attacks. Margaret falls down the basement steps and pulls down a gas pipe. Alice ignites a kitchen fire that blows up the house in order to escape the Crooked Man. After visiting Alice in the hospital burn ward where she lies in a coma, Noah takes Olivia to a remote location that she saw in a vision when she touched the box. A crooked house appears and they go inside. Olivia plays the box and sings the rhyme to summon the Crooked Man. The Crooked Man appears and a long battle ensues. Olivia and Noah eventually reason that they can reverse the curse by playing the music box backwards. Olivia winds the key in the opposite direction. As the notes play in reverse, a light appears through the window that burns the Crooked Man until he dissipates. Olivia and Noah escape as the crooked house collapses. Olivia throws the music box at the house and everything disappears. Meanwhile, Milo busily destroys all traces of his Crooked Man website and research. However, the site ends up back online as three young girls elsewhere dare each other to sing the rhyme. “There was a crooked man, and he walked a crooked mile…” So starts the notorious nursery rhyme that trumps “Bloody Mary” as a go-to dog dare for 12-year-olds looking to put the “pee” in their pjs. Young Olivia’s skeptical pfft at this urban legend of a song that can kill earns her such an “oh yeah?” challenge from her slumber party sisters. What the girls don’t expect is that the rhyme really does summon a demon, and Olivia’s friend Jill pays the piper with her life. Worse still, Olivia is left holding the bloody knife, telling tall tales of a Crooked Man no one else saw. Olivia ends her subsequent psych ward stay six years later. Unfortunately, she’s coming home to a small town full of side-eyes, stares, and whispers. Everyone in town shuns the troubled young woman, including former friends holding tight to their belief that Olivia is to blame for the blade that killed Jill. Everyone that is, except Noah Harris, big brother to one of Olivia’s old classmates who, wouldn’t you know it, grew into a photogenic man ready-made for a walk-on role in any CW series of choice. Not only do Noah’s stubbled cheeks and headshot-ready haircut make him the perfectly predictable romantic interest for Olivia, but his convenient career as a police officer places him just as perfectly for partnering up to solve the Crooked Man mystery. Since Olivia’s release, each person present that night the Crooked Man came has been dying one by one, about ten movie minutes apart, immediately before each commercial break. Olivia is up against the clock to convince her stubborn gal pals that the evil entity has returned for the rest of them. Even with a handful of folks onboard alongside Noah, she is also going to need the help of a serendipitously arriving man named Milo, who holds the key to the backstory Olivia desperately requires to reverse the Crooked Man’s curse. 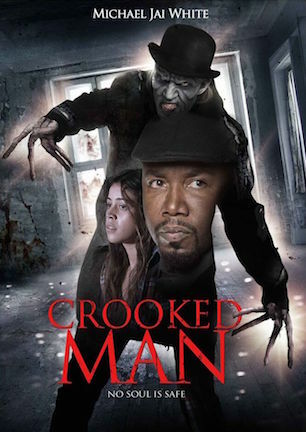 SyFy Original film “The Crooked Man” is a straightforward made-for-cable fright flick. Director Jesse Holland has previously played in more daring indie horror territory with the psychologically-centered spooks of “Yellowbrickroad” and “We Go On” (review here). Here, Holland sticks instead to by-the-book standards of pat plotting and simple setups that read as routine, but with a mild manner that is amusingly entertaining rather than strictly pedestrian. I don’t have the details to determine if the Crooked Man’s popularity in “The Conjuring 2” (review here) did indeed put this full-blown version of his folklore on a fast track to completion. Though it’s a harder argument to make that certain portions of the production definitely didn’t feel the pinch of being rushed. 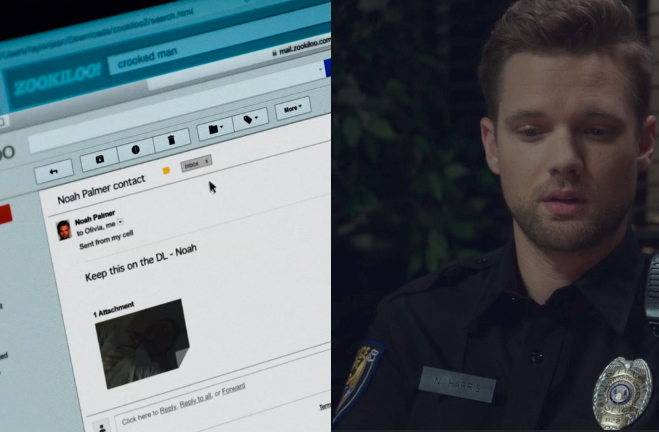 A sign behind Olivia on the mental hospital steps reads “Psyciatric” without an “h.” Noah’s stated last name and the one on his nametag is Harris, yet the one on his email to Olivia says Palmer in two places. There is a conclusively distinct sense that wherever the eyes of production design were pointed, it wasn’t on details. Sore thumb scenes also stick out as included purely for plot movement or are staged so awkwardly that they practically scream, “there wasn’t enough time/interest for a rewrite!” One unnecessary moment has Olivia anxious to get inside a crowded nightclub to warn a performer. Tired of waiting with the riff raff out front, Olivia huffs up to the doorman pleading, “please, please, our friend is in danger” with the same yawning urgency Willy Wonka used to warn Mike Teavee and Augustus Gloop. Without missing a beat, the bouncer responds, “go in” and unhooks the rope before Olivia has barely finished her breath. Try this tactic next time you want to jump a line. See how far you get. Odd thing is, the script doesn’t need this at all. Why not have Olivia simply enter the club normally since it moves her to the exact same place while avoiding an implausible aside? A similar instance occurs when Olivia and Noah enter an old house to summon the Crooked Man with a music box. Olivia could just sit down and play the tune right away. Still needing to fill three more minutes for the time slot however, the duo instead pointlessly explores the house first, leading to the most cliché jump scare possible: a cat jumping from furniture. Other eye-rollers? How about animating the Crooked Man to look like a Tool video unable to maintain a stable framerate? Or top-billed stars Michael Jai White, Amber Benson, and Dina Meyer combining for less screen time than almost any other individual character? And my personal favorite, exposition so nonsensically conceived, like why the Crooked Man disappeared for six years or how he was created in the first place, characters literally explain things using the word “somehow” and leave it at that? The funny bit about these faults is, “The Crooked Man” knows how conventional it is, and that’s okay with everyone, audience included. By understanding its aspiration to be average, the film finds a fair bit of fun in following formula and its tiredness is rarely tiresome. When the movie makes its first victim a pre-teen girl with a snapped neck and butchered belly, you at least know “The Crooked Man” isn’t playing it completely safe for a typical small screen thriller. It fills out just fine for a film permitting viewers to set imaginations on idle. I wouldn’t necessarily recommend the movie, but I wouldn’t discourage anyone from giving it a “why not?” whirl either. Will you want to own it on home video for repeat viewings every Halloween? No. But for a one-and-done viewing to kick off October? Sure. September 30, 2016 by Ian Sedensky.